His Holiness Abune Mathias Patriarch of Ethiopia, Archbishop of Axum and Ichege of the See of Saint Taklehaimanot, comforted victims of the landslide at Koshe landfill site, in Kolfe Keranyo sub city, on March 19, 2017. While visiting the victims, His Holiness expressed his sadness over the tragic loss of lives and comforted the families of the departed with the Word of God. 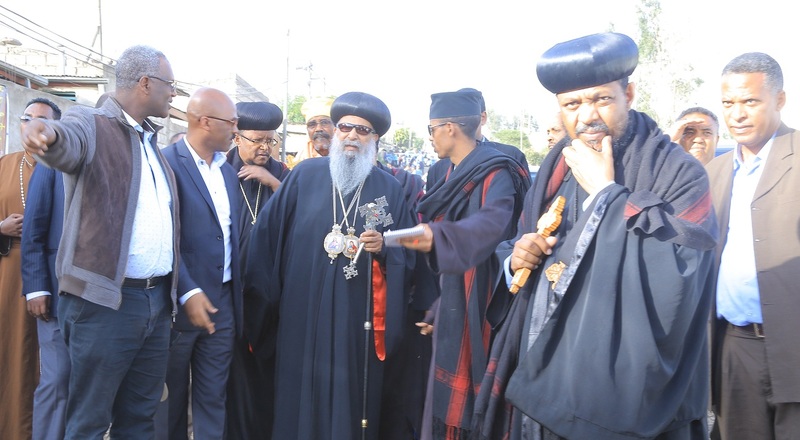 Along with the Patriarch, His Grace Abune Sawiros, Secretary of the Holy Synod and Archbishop of South West Shewa diocese, and His Grace Abune Deyosqoros, General Manager of the Ethiopian Orthodox Tewahedo Church Patriarchate and Archbishop of Southern Tigray, South Eastern and Eastern Tigray Dioceses soothed the victims who are in a makeshift shelter. It is to be recalled that last week, the Holy Synod declared a seven-day prayer for the departed in every parish, and donated ETB 200,000 to support the victims and bereaved families who lost all their belongings due to the accident. The landslide, which swept through a massive garbage dump on March 11, 2017 in Kolfe Keranyo sub city, killed more than 100 people, leaving dozens missing. The landfill has been a dumping ground for Addis Ababa for more than 50 years. May God rest the souls of the departed in peace! !